Is your wireless connection, or lack thereof, driving you mad? Do you find yourself excited to add smart gadgets to your home only to be frustrated by sluggish service and the constant loss of connectivity? While it often has to do with the quality of service from your Internet Service Provider, how well your home network processes and connects to the available service has a lot to do with the quality of your networking equipment. Let’s help demystify why your devices are struggling to stay connected. Everyone knows that the types of applications and devices we use today are overwhelmingly audio and video centric—video doorbells, in-home cameras, video surveillance systems, Facetime, Amazon Echo, Netflix, Spotify, wireless speakers and smart TVs—the list goes on and on. But what is lesser known is that audio and video streaming, especially high-definition (HD), is very taxing in terms of data usage and both are considered latency-sensitive data traffic. This means they can hog a lot of your bandwidth and are more sensitive to the inconsistency of a strained network. Because we expect steady, high-quality streaming and instantaneous connections, throughput and device capacity in terms of wireless service are more important than ever. Since technology is evolving so quickly, it’s important to have a network that not only supports your technology needs today, but can also scale to meet your technology goals in the future. Now, that we’ve considered the types of devices and applications, ask yourself how many Internet-connected devices you have added to your home in the last three years? In that time, my husband and I have added a video doorbell, smart lighting in two rooms, wireless speakers, two Amazon Alexa devices, and smart TVs that exclusively stream video from web-based applications to our very modest-sized apartment. But we’re not alone. According to reports, by 2020 there will be 31 billion smart devices installed world-wide! Now ask yourself when was the last time you upgraded your home network? Not just the service plan from your ISP, but the last time you actually made sure the hardware was up to par? If you haven’t reviewed the quality of your network in a while, then it’s time you did. 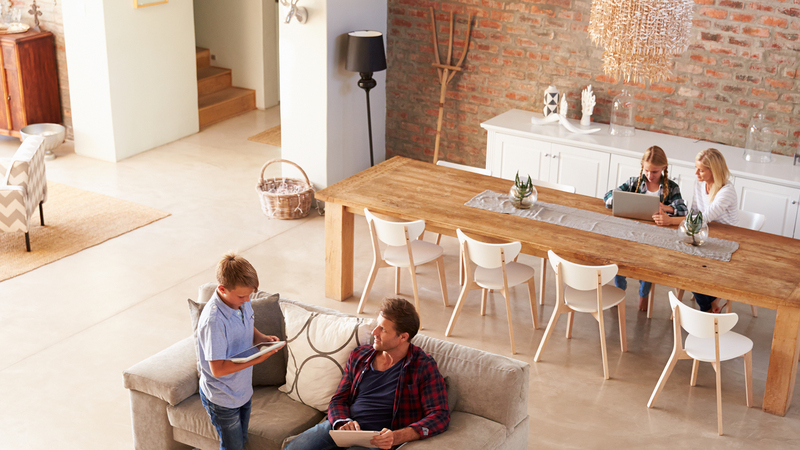 It is, after all, the foundation that supports all of the connected technology in your home. To start, your router throughput should meet or exceed the speed of the service you are subscribed to via your Internet Service provider; otherwise, you aren’t making use of the service you are paying for. Especially as Gigabit speeds are becoming more common worldwide, you’ll want a router that can actually utilize all that speed. Most ISPs provide a piece of networking equipment that serves as both a router and a wireless access point, but if your home is larger or includes many smart/connected devices, then you really should use dedicated wireless access points in addition to, or instead of, the wireless capabilities that might be built-in to your router. You’ll also want to consider using wireless access points if your home is made of building materials that are made of high-density or refractive building materials (e.g. interior walls made of stone or floor-to-ceiling mirror walls) which can block or interfere with wireless signals. Why? Dedicated wireless access points can be more appropriately placed so the signal doesn’t have to pass through problematic building materials and so that your wireless source is located in key areas. They also allow your network to handle more wireless connections. Tip: Wireless repeaters or extenders are poor solutions for trying to stretch your wireless signal. They extend wireless signals by ‘stealing’ speed from the wireless source. So, while you might get a little more connection is a father out corner of your home you will have diminished your wireless performance throughout the rest of the house. If any of your connected systems are critical or are primarily used for latency-sensitive video streaming and storage (think home security system), then you should seriously consider hardwiring those connected devices. Not only is it more secure, it will also free up bandwidth on your wireless for devices that need to be mobile. Last but certainly not least, your network should support the latest wireless technology (802.11ac a.k.a. wireless-AC). Keep reading to understand what that means. WHAT ARE THE BENEFITS OF WIRELESS-AC? The latest home technologies operate on the latest wireless standards, and for the last few years that has been wireless-AC. Compared to the old wireless-N (common in 2007-2015), wireless-AC can support 5x more throughput, support approximately twice as many devices, and performs better at greater distances. The newer standard, wireless-AC, also has the benefit of having two available bands (similar to how radio has AM vs FM). So what does all this mean for you? For one, if your network’s wireless equipment only supports up to wireless-N, then your newer connected devices aren’t going to operate reliably and won’t be able to make the most of whatever throughput should be available. Secondly, if you’re using the newer wireless-AC which can support more devices, then you won’t struggle as much with devices losing connectivity because they were bumped off an overexerted WiFi network. And thirdly, since wireless-AC has dual-bands, you can connect devices to different bands to make more efficient use of your connections. Like AM and FM radio, newer wireless-AC has dual-bands known as 2.4 GHz and 5 GHz bands. The 2.4Ghz band is like AM radio, it’s older and not the best connection, but can cover longer distances and is less affected by interference. The 5 GHz band is like FM radio, a much better connection, but can’t go quite as far as the lower frequency band. Newer devices that rely on fast, high-performance connections for audio or video streaming or instantaneous connections should go on the 5 GHz band. The 2.4 GHz band is great for devices like baby monitors that aren’t very high-tech, but should be able to stay connected even if you are deep into the backyard. Don’t be. In summary, if you want to connect more devices and have more control over how your devices are connected, you need to have a network that supports wireless-AC (802.11ac) and you should seriously consider a dedicated wireless access point. The rest you’ll learn through trial and error as you continue to research wireless and Internet of Things technology. But if that still sounds like a lot of trouble, then do as many people do, and consult with a smart home or networking professional. They are trained to set-up a reliable and efficient network that will support your technology needs. Misconfiguration, as well as improper placement and installation, can cause even the most reliable equipment to stutter. The best way to ensure that your networking system has been installed correctly is to have a professional handle the work, such as a Pakedge Certified Network Administrator (PCNA). Yes, it will add to your bottom line, but if your goal is to create a truly smart home that actually adds value to your life and your home, then pro is the way to go. Learning the ins-and-outs of networking and the mental and physical labor of building and maintaining a robust network that can support current and future technologies is a full-time job—and I am guessing you already have one of those. A networking professional is able to pinpoint possible WiFi interference and devise workarounds based on the layout and structure of your home. A networking professional can select the best equipment for the job, configure them to be more effective, and place wireless access points where they will maintain the clearest, most reliable connections. Moreover, a professional is able to design the networking system to grow and evolve to handle your networking needs in the future.